Students generally proceed through three phases as they develop mastery with any particular set of facts.
. Modeling Phase: Modeling and/or counting all or counting on to find the answer: For example, using fingers to help keep track of their counts to solve 5+7=? While our ultimate goal is for all students to demonstrate fact fluency automaticity, it is important to first help them develop their understanding of facts and related unknown facts using reasoning and math strategies. 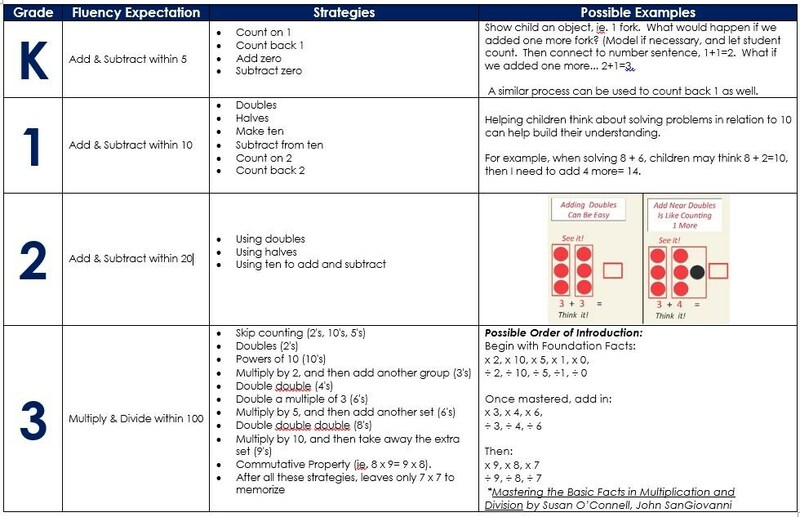 Listed below are fluency expectations by grade level, with accompanying fact strategies to use to build student understanding. Use the pictorial cards to the right, to help solidify these concepts with your student.